Preheat the broiler on the highest setting and line a baking sheet with aluminum foil. Place the ear of corn on the lined baking sheet and drizzle with the canola oil. Turning occasionally, broil until cooked through and charred in some areas, about 15 minutes. Transfer to a bowl and set aside to cool. In a small bowl, combine the shallot and vinegar. Set aside, allowing the vinegar to marinate the shallot, about 10 minutes. In a bowl, combine the garlic powder, onion powder, oregano, paprika, salt, cayenne, dried thyme, and pepper. Set aside. Pat the catfish dry with paper towels and place on the aluminum foil lined sheet tray. Liberally coat both sides of each filet with the melted butter and seasoning mixture. Broil the fish until cooked through and blackened, about 4 minutes per side. Cut the charred corn kernels from the cob and place in the bowl. Add the tomatoes, cucumbers, lime juice, and salt. Stir to combine, then gently fold in the avocado. 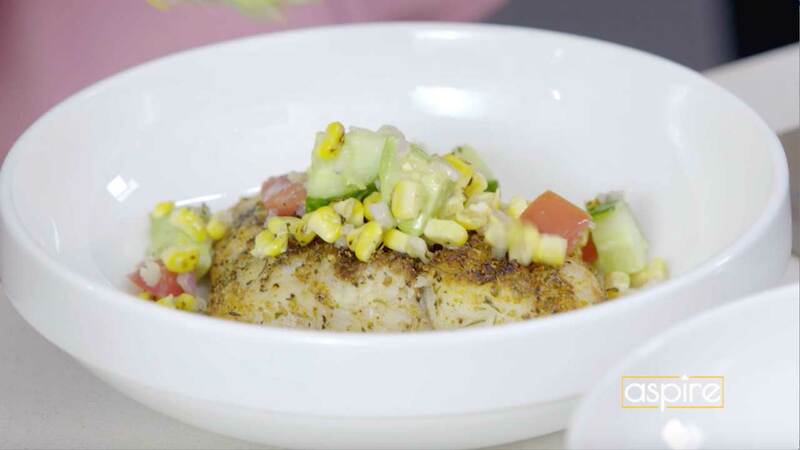 Serve the catfish warm and immediately with the avocado relish.